Since 1975, they’ve sold over 15 million albums, built a classic catalog of hits, and played more than 8,000 ferocious live shows. They broke records with their 50 Dates/50 States tour, delivered landmark performances at Live Aid, on SNL and became mainstays of radio, MTV and stages worldwide for more than two generations. Through it all, they’ve remained one of the most consistent – and consistently passionate – progenitors of blues-based rock in pop culture history. 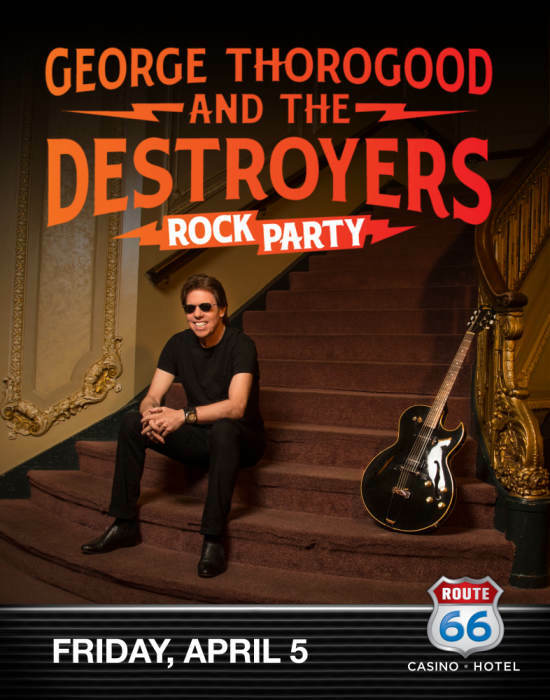 For the past 45 years, it’s been very good to be George Thorogood & The Destroyers.And in 2019, their Good To Be Bad Tour: 45 Years Of Rock will prove why like never before. “If you’re content, you may as well be dead.” George laughs with his familiar rasp. “I think everyone has thoughts about retiring, but the phone keeps ringing. You want me and The Destroyers to come to your town, set up our gear, wear some badass clothes and play ‘Who Do You Love?’ End of conversation. Let’s rock!” For Thorogood and his longtime band – Jeff Simon (drums, percussion), Bill Blough (bass guitar), Jim Suhler (rhythm guitar) and Buddy Leach (saxophone) – the power to rock audiences has been both battle cry and creed from the beginning. “Since I was 17,” George says, “all I wanted to do was see how far I could go with my guitar, putting my own spin on music I loved.”After a few hard years as a solo acoustic performer – a period he would revisit with his acclaimed 2017 album Party Of One – George added a drummer and bass player in 1974 to form the electric trio he called The Destroyers. The band soon became a sensation throughout the Delaware Valley and New England club circuit, and in 1976 signed with Cambridge-based label Rounder Records. Over the course of 16 studio albums – including two Platinum and six Gold discs on Rounder, EMI and Capitol – Thorogood and The Destroyers toured the globe, as Rolling Stone once raved, “playing rock & roll hot enough to melt the polar icecaps and flood the world’s major population centers.” “We’re on a very short list of bands that are still having fun doing this,” Jeff says. “And we’re still looking over our shoulders thinking that somebody will catch us at it.” Thorogood & The Destroyers indeed remain unstoppable. But after 45 years of rock – and no signs of stopping – can Thorogood point to what continues to make it all matter? “My highlight is every night when I walk on that stage and play our hits for those happy people,” he says. “At the end of the show, the audience is smiling, I don’t see any police and everyone got their money’s worth.” More importantly, is it still good to be bad? George Thorogood instantly flashes that huge grin. “You bet it is,” he says. ”We’ll always be the baddest band in the land.